Rheumatoid arthritis (RA) is a systemic inflammatory disease that results in cartilage and bone destruction. RA is characterized by a typical pattern and distribution of synovial joint involvement. Disorganization of the joint leads to deformities and loss of function. In the hands, the metacarpophalangeal (MCP), proximal interphalangeal (PIP), and thumb interphalangeal (IP) joints are most frequently involved. The distal interphalangeal (DIP) joints are involved only in the presence of a coexisting MCP or PIP disease. Tenosynovitis of the flexor tendons causes a reduction in finger flexion and grip strength. Nodular thickening in the tendon sheath may also produce a trigger finger. The hands are affected symmetrically, and the disease process is usually visible first at the second and third MCP joints and the third PIP joint. The disease continues in the remainder of the MCP and PIP joints. Varying stages may be seen in different joints at a single point in time. DIP joint involvement without proximal involvement is rare. Erosions may be detected first either in the MCP and PIP joints or at the carpal bones. 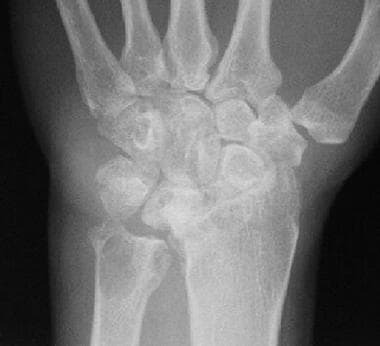 Erosions may also be seen at the intra-articular portion of the distal end of the radius or within the carpal bones. Carpal bone ankylosis is a common and fairly specific sign, particularly in the Asian population, in whom it tends to occur early in the disease process. In the wrist, the early stages of RA cause tenosynovitis of the extensor tendons, causing swelling over the distal wrist. The ulnar styloid may become tender, which indicates inflammatory synovitis. The distal end of the ulna tends to sublux dorsally, and the carpal bones sublux anteriorly to the distal radius and ulna. Although occasional flares of joint pain occur throughout the course of the disease, these can usually be controlled with the use of anti-inflammatory medication, especially early in their course. When joint subluxations and deformity take place, performing basic daily tasks (eg, writing and holding utensils) can become a problem. Some patients resort to the use of custom-designed writing instruments or utensils to overcome this difficulty. The primary effect of RA is in joint deformity and fusion, which occurs in the advanced stages. Permanent disability occurs in approximately 10-20% of patients. Complications of therapy may be seen, such as generalized osteoporosis from steroid usage. Large bony erosions and severe osteopenia predispose patients to relatively atraumatic fractures. Long-term steroid use also predisposes patients to avascular necrosis. 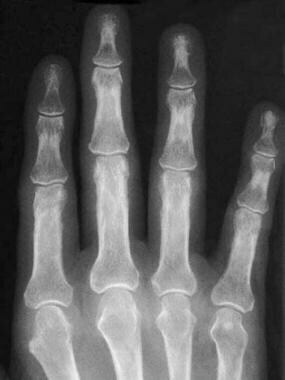 Soft-tissue swelling and early erosions in the proximal interphalangeal joints in a patient with rheumatoid arthritis of the hands. 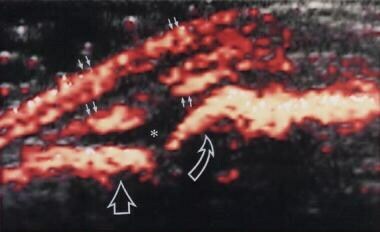 Power Doppler image shows hyperemic blood flow in the flexor tendon sheath in a patient with rheumatoid arthritis of the hands. Ultrasonography-guided synovial biopsy of the second metacarpophalangeal joint of the right hand in a patient with rheumatoid arthritis of the hands. 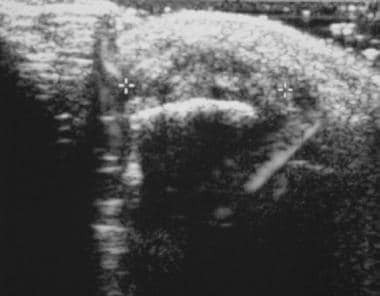 The biopsy needle is seen as a straight echogenic line on the left side of the image in an oblique orientation. Computed tomography (CT) has a minimal role in treating RA of the hands. Although CT is useful for demonstrating bony pathology, erosions in the small joints of the hands are evaluated best by using a combination of radiography and MRI. MRI also has the added advantage of being able to visualize bone marrow edema and synovial and soft-tissue involvement. RA may occur as part of a mixed connective tissue disease in which clinical and radiologic appearances are not typical of one particular disease. RA is indicated on radiographs by the overall pattern and features of joint involvement. 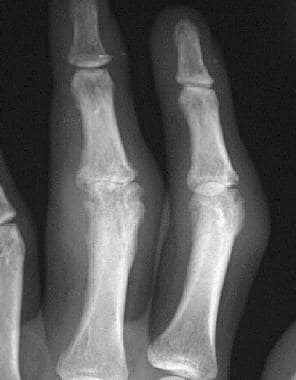 Although the presence of bony erosions is typical of RA, erosions are not specific because of the large number of other erosive arthritides. An absence of osteophyte formation and subchondral sclerosis is also indicative of RA rather than osteoarthritis. Of concern is the possibility of misdiagnosing another erosive arthropathy as RA or vice versa. Because the diagnosis of RA is a predominantly clinical one, the primary role of imaging is in follow-up observation. In the late stage (but not in the early stage), the deformities and joint fusion of RA are usually distinguishable from other causes of erosive arthropathy. No normal variants simulate RA. Prominent juxta-articular osteopenia in all interphalangeal joints in a patient with rheumatoid arthritis of the hands. 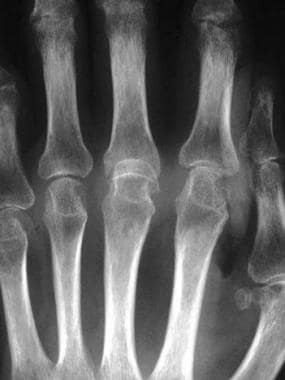 Well-defined bony erosions in the carpal bones and metacarpal bases in a patient with rheumatoid arthritis of the hands. Multiple erosions with deformity of the carpal bones in a patient with rheumatoid arthritis of the hands. Follow-up radiograph obtained after an 18-month interval in a patient with rheumatoid arthritis of the hands. Ankylosis of the carpal bones has occurred, with enlargement of the erosions. Subluxation in the metacarpophalangeal joints, with ulnar deviation, in a patient with rheumatoid arthritis of the hands. 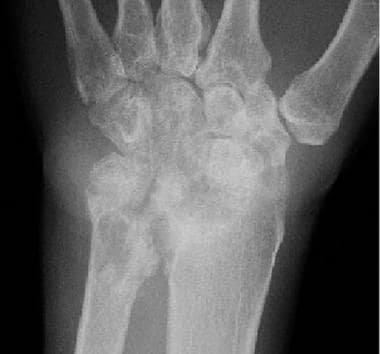 Subluxation at the third metacarpophalangeal joint and marginal erosions at the heads of the second to fourth metacarpals in a patient with rheumatoid arthritis of the hands. Marked ankylosis of most of the carpal bones in a patient with rheumatoid arthritis of the hands. 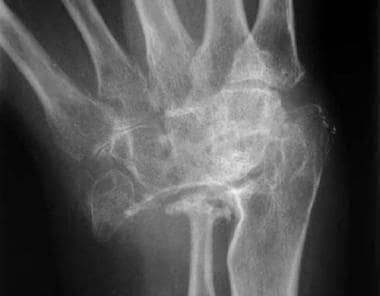 Partial collapse of fused carpal bones with subluxation at the radiocarpal joint in a patient with rheumatoid arthritis of the hands. Coronal fine-section gradient echo MR image demonstrates multiple erosions in the carpal bones and bases of the metacarpals, with pannus formation around the distal ulna. Axial proton-density weighted MR image at the level of the radio-carpal joint shows extensive tenosynovitis involving the dorsal extensor and volar flexor tendons, with fluid in the tendon sheaths. 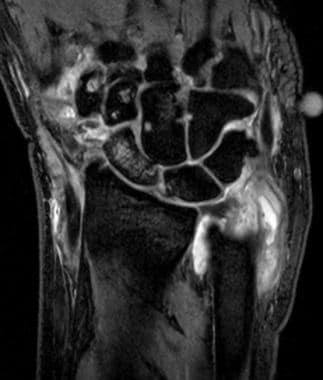 Axial T2-weighted fat-suppresed MR image at the level of the carpal bones shows diffuse synovial hypertrophy over the dorsal aspect (arrows), with a heterogenous appearance and adjacent fluid. Fluid is also present in the dorsal extensor tendon sheaths. Axial T1-weighted MR image of the wrist before and after gadolinium administration shows diffuse contrast enhancement in the areas of synovial hypertrophy and thickening, over both the dorsal and volar aspects. Gadolinium-based contrast agents have been linked to the development of nephrogenic systemic fibrosis (NSF) or nephrogenic fibrosing dermopathy (NFD). These diseases have occurred in patients with moderate to end-stage renal disease after being given a gadolinium-based contrast agent to enhance MRI or magnetic resonance angiography (MRA) scans. NSF/NFD are debilitating and sometimes fatal diseases. Characteristics include red or dark patches on the skin; burning, itching, swelling, hardening, and tightening of the skin; yellow spots on the whites of the eyes; joint stiffness with trouble moving or straightening the arms, hands, legs, or feet; pain deep in the hip bones or ribs; and muscle weakness. Illustration of the scanning technique. Photograph depicts the typical scanning technique with application of the Entos Probe to the volar (flexor) aspect of the third metacarpophalangeal joint. The technique allows visualization of the joint surfaces, flexor tendon, and synovial sheaths in patients with rheumatoid arthritis. Amplitude color Doppler sonogram in a patient with active rheumatoid arthritis. Dorsal (extensor) surface of the second metacarpophalangeal joint is imaged. Intense-amplitude Doppler color flow signal demarcates the inflamed synovium (ie, joint pannus) resulting from severe hyperemia. Solid arrows indicate the extensor tendon sheath and dorsal and volar margins. Straight open arrow indicates the synovium of the joint overlying the proximal phalanx of the second digit. Curved open arrow indicates the inflamed synovium overlying the metacarpal. The asterisk indicates a small amount of anechoic fluid in the joint space. Two reports in the literature have explored a possible role for Doppler ultrasonography in evaluating arthritis, especially RA, on the basis of synovial hyperemia. Newman et al  used a 3-level semiquantitative approach by trained radiologists to grade Doppler flow subjectively in patients with RA, psoriatic arthritis, and calcium pyrophosphate deposition disease arthritis. The investigators found that the degree of abnormal tissue hyperemia visualized correlates grossly with the severity of local disease activity as measured by synovial-fluid white blood cell (WBC) counts and patients' subjective estimates of symptoms. The report did not include joint examinations or other physical/functional measurements. Hau et al  from the University Hospital of Wurzburg, Germany, reported findings from ultrasound in the MCP and PIP joints of 34 patients with RA and 15 control subjects over a 6-month period. In the protocol, each patient was examined only once. Patients were stratified into 3 groups based on swelling and tenderness. Ultrasonography was performed by using a Siemens Doppler unit and a 5- to 13-MHz linear-array transducer operating at 12 MHz. The authors identified joint pannus on gray-scale images as hypoechoic soft tissue adjacent to the articular surfaces and described the pannus distribution as favoring the radial side of the joints. Velocity color Doppler (ie, conventional direction-sensitive Doppler) imaging was used to evaluate vascularization and blood flow in the rheumatoid pannus as a surrogate marker of inflammation. The quantitation method used was analogous to that used by one of the coauthors of this article in preliminary studies. A simple image-based quantification was obtained in the study by Hau et al  by summing the color pixels within all joints in each patient classification after selection of regions of interest within each joint. The result was a unitless numerical scale that showed a greater than tenfold difference between patients with active RA and controls. From the preliminary investigations, both the Newman and Hau studies [32, 33] concluded that power Doppler ultrasonography can reflect disease activity in RA, and each group suggested further research in this area. Teh et al  evaluated quantitative power Doppler ultrasonography for the assessment of therapeutic response in rheumatoid synovitis in 13 consecutive patients over 7 months, with correlation to serum inflammatory markers and clinical evaluation. Quantitiative power Doppler spectra were derived within select regions of interest from each patient’s scan, both before and after treatment; essentially, the method used was an automated pixel-counting technique similar to that of Hau. There was extremely good correlation between the image-based quantitation of synovial hyperemia and the clinical and laboratory assessment of disease activity in this study. Thus, quantitative power Doppler ultrasonography was able to accurately depict the patients’ response to treatment. The authors of the study felt that the addition of quantitative power Doppler ultrasonography to the routine assessment of therapeutic response in RA yielded more accurate findings than existing clinical and laboratory methods alone. Strunk et al  compared quantified power Doppler ultrasonography with laboratory measurement of serum vascular endothelial growth factor (VEGF level) as markers for disease activity, finding a very high correlation (P< 0.0001) for ultrasound and no relation with the immediate serum VEGF level in the same patient. Salaffi et al  evaluated quantified power Doppler ultrasonography augmented by the use of IV ultrasound contrasts, such as Levovist, using a quantitative time-intensity curve integration to arrive at the quantification in arbitrary units. The results showed a correlation of the Doppler signal to other measures of disease and treatment efficacy. Fiocco et al  found that both C-reactive protein and Doppler findings reliably measured response to treatment with etancercept, an anti–tumor necrosis factor-alpha medication that has shown considerable efficacy in rheumatoid arthritis. What is rheumatoid arthritis (RA) and how does it affect the hands? What is the role of hand imaging in the workup of rheumatoid arthritis (RA)? 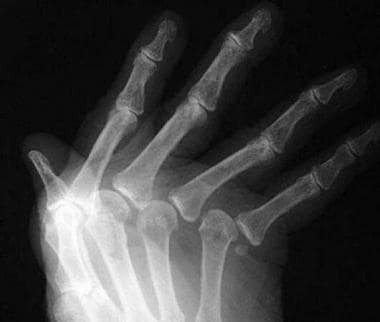 Which findings on radiography are characteristic of rheumatoid arthritis (RA) in the hands? What is the characteristic distribution of rheumatoid arthritis (RA) in the hands on radiographs? What is the degree of confidence in the use of had radiographs in the diagnosis of rheumatoid arthritis (RA)? 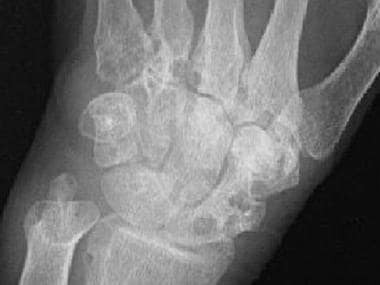 What is the accuracy of hand radiography in the diagnosis of rheumatoid arthritis (RA)? What is the role of CT scanning of the hand in the evaluation of rheumatoid arthritis (RA)? What is the role of MRI of the hand in the evaluation of rheumatoid arthritis (RA)? What is the accuracy of MRI of the hands in the diagnosis of rheumatoid arthritis (RA)? What is the role of ultrasonography of the hands in the workup of rheumatoid arthritis (RA)? Guermazi A, Taouli B, Lynch JA, Peterfy CG. Imaging of bone erosion in rheumatoid arthritis. Semin Musculoskelet Radiol. 2004 Dec. 8(4):269-85. [Medline]. Tehranzadeh J, Ashikyan O, Dascalos J. Advanced imaging of early rheumatoid arthritis. Radiol Clin North Am. 2004 Jan. 42(1):89-107. [Medline]. Naraghi AM, White LM, Patel C, Tomlinson G, Keystone EC. Comparison of 1.0-T extremity MR and 1.5-T conventional high-field-Strength MR in patients with rheumatoid arthritis. Radiology. 2009 Jun. 251(3):829-37. [Medline]. Suzuki T, Ito S, Handa S, et al. 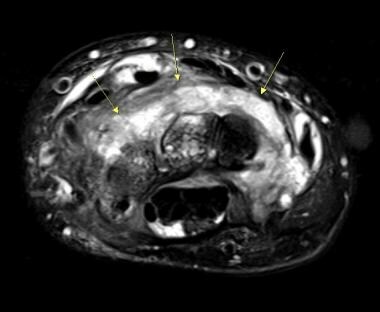 A new low-field extremity magnetic resonance imaging and proposed compact MRI score: evaluation of anti-tumor necrosis factor biologics on rheumatoid arthritis. Mod Rheumatol. 2009. 19(4):358-65. [Medline]. Burgers LE, Nieuwenhuis WP, van Steenbergen HW, Newsum EC, Huizinga TW, Reijnierse M, et al. Magnetic resonance imaging-detected inflammation is associated with functional disability in early arthritis-results of a cross-sectional study. Rheumatology (Oxford). 2016 Sep 15. [Medline]. Wakefield RJ, Kong KO, Conaghan PG, et al. The role of ultrasonography and magnetic resonance imaging in early rheumatoid arthritis. Clin Exp Rheumatol. 2003 Sep-Oct. 21(5 Suppl 31):S42-9. [Medline]. Pearman L, Last J, Fitzgerald O, et al. Rheumatoid arthritis: a novel radiographic projection for hand assessment. Br J Radiol. 2009 Jul. 82(979):554-60. [Medline]. Gilkeson G, Polisson R, Sinclair H, et al. Early detection of carpal erosions in patients with rheumatoid arthritis: a pilot study of magnetic resonance imaging. J Rheumatol. 1988 Sep. 15(9):1361-6. [Medline]. Singson RD, Zalduondo FM. Value of unenhanced spin-echo MR imaging in distinguishing between synovitis and effusion of the knee. AJR Am J Roentgenol. 1992 Sep. 159(3):569-71. [Medline]. Sugimoto H, Takeda A, Hyodoh K. Early-stage rheumatoid arthritis: prospective study of the effectiveness of MR imaging for diagnosis. Radiology. 2000 Aug. 216(2):569-75. [Medline]. Beals C, Baumgartner R, Peterfy C, Balanescu A, Mirea G, Harabagiu A, et al. Magnetic resonance imaging of the hand and wrist in a randomized, double-blind, multicenter, placebo-controlled trial of infliximab for rheumatoid arthritis: Comparison of dynamic contrast enhanced assessments with semi-quantitative scoring. PLoS One. 2017. 12 (12):e0187397. [Medline]. Jevtic V, Watt I, Rozman B, et al. Contrast enhanced Gd-DTPA magnetic resonance imaging in the evaluation of rheumatoid arthritis during a clinical trial with DMARDs. A prospective two-year follow-up study on hand joints in 31 patients. Clin Exp Rheumatol. 1997 Mar-Apr. 15(2):151-6. [Medline]. Konig H, Sieper J, Wolf KJ. 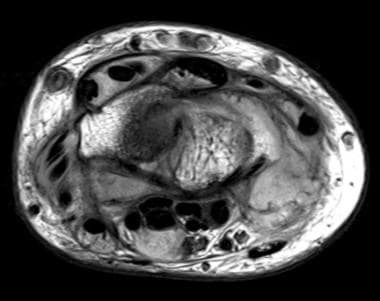 Rheumatoid arthritis: evaluation of hypervascular and fibrous pannus with dynamic MR imaging enhanced with Gd-DTPA. Radiology. 1990 Aug. 176(2):473-7. [Medline]. Reiser MF, Bongartz GP, Erlemann R, et al. Gadolinium-DTPA in rheumatoid arthritis and related diseases: first results with dynamic magnetic resonance imaging. Skeletal Radiol. 1989. 18(8):591-7. [Medline]. Poleksic L, Zdravkovic D, Jablanovic D, et al. Magnetic resonance imaging of bone destruction in rheumatoid arthritis: comparison with radiography. Skeletal Radiol. 1993 Nov. 22(8):577-80. [Medline]. Black RJ, Spargo L, Schultz C, et al. 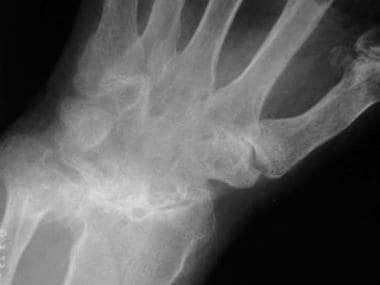 Decline in hand bone mineral density indicates increased risk of erosive change in early rheumatoid arthritis. Arthritis Care Res (Hoboken). 2014 Apr. 66(4):515-22. [Medline]. Olech E, Crues JV 3rd, Yocum DE, Merrill JT. Bone marrow edema is the most specific finding for rheumatoid arthritis (RA) on noncontrast magnetic resonance imaging of the hands and wrists: a comparison of patients with RA and healthy controls. J Rheumatol. 2010 Feb. 37(2):265-74. [Medline]. Lisbona MP, Pamies A, Ares J, et al. Association of bone edema with the progression of bone erosions quantified by hand magnetic resonance imaging in patients with rheumatoid arthritis in remission. J Rheumatol. 2014 Aug. 41 (8):1623-9. [Medline]. Taniguchi D, Tokunaga D, Oda R, et al. Maximum intensity projection with magnetic resonance imaging for evaluating synovitis of the hand in rheumatoid arthritis: comparison with clinical and ultrasound findings. Clin Rheumatol. 2014 Jul. 33(7):911-7. [Medline]. Akai T, Taniguchi D, Oda R, Asada M, Toyama S, Tokunaga D, et al. Prediction of radiographic progression in synovitis-positive joints on maximum intensity projection of magnetic resonance imaging in rheumatoid arthritis. Clin Rheumatol. 2016 Apr. 35 (4):873-8. [Medline]. Schwenzer NF, Kotter I, Henes JC, et al. The role of dynamic contrast-enhanced MRI in the differential diagnosis of psoriatic and rheumatoid arthritis. AJR Am J Roentgenol. 2010 Mar. 194(3):715-20. [Medline]. Grassi W, Tittarelli E, Blasetti P, et al. Finger tendon involvement in rheumatoid arthritis. Evaluation with high- frequency sonography. Arthritis Rheum. 1995 Jun. 38(6):786-94. [Medline]. Szkudlarek M, Court-Payen M, Strandberg C, et al. Contrast-enhanced power Doppler ultrasonography of the metacarpophalangeal joints in rheumatoid arthritis. Eur Radiol. 2003 Jan. 13(1):163-8. [Medline]. Hammer HB, Kvien TK, Terslev L. Ultrasound of the hand is sufficient to detect subclinical inflammation in rheumatoid arthritis remission: a post hoc longitudinal study. Arthritis Res Ther. 2017 Oct 4. 19 (1):221. [Medline]. Naredo E, Bonilla G, Gamero F. Assessment of inflammatory activity in rheumatoid arthritis: a comparative study of clinical evaluation with grey scale and power Doppler ultrasonography. Ann Rheum Dis. 2005 Mar. 64(3):375-81. [Full Text]. Moller B, Bonel H, Rotzetter M, Villiger PM, Ziswiler HR. Measuring finger joint cartilage by ultrasound as a promising alternative to conventional radiograph imaging. Arthritis Rheum. 2009 Apr 15. 61(4):435-41. [Medline]. Cyteval C. Doppler ultrasonography and dynamic magnetic resonance imaging for assessment of synovitis in the hand and wrist of patients with rheumatoid arthritis. Semin Musculoskelet Radiol. 2009 Mar. 13(1):66-73. [Medline]. De Flaviis L, Scaglione P, Nessi R, et al. Ultrasonography of the hand in rheumatoid arthritis. Acta Radiol. 1988 Jul-Aug. 29(4):457-60. [Medline]. Fornage BD. Soft-tissue changes in the hand in rheumatoid arthritis: evaluation with US. Radiology. 1989 Dec. 173(3):735-7. [Medline]. Gibbon WW. Applications of ultrasound in arthritis. Semin Musculoskelet Radiol. 2004 Dec. 8(4):313-28. [Medline]. Snekhalatha U, Muthubhairavi V, Anburajan M, Gupta N. Ultrasound Color Doppler Image Segmentation and Feature Extraction in MCP and Wrist Region in Evaluation of Rheumatoid Arthritis. J Med Syst. 2016 Sep. 40 (9):197. [Medline]. Newman JS, Laing TJ, McCarthy CJ, Adler RS. Power Doppler sonography of synovitis: assessment of therapeutic response--preliminary observations. Radiology. 1996 Feb. 198(2):582-4. [Medline]. Hau M, Schultz H, Tony HP, et al. Evaluation of pannus and vascularization of the metacarpophalangeal and proximal interphalangeal joints in rheumatoid arthritis by high-resolution ultrasound (multidimensional linear array). Arthritis Rheum. 1999 Nov. 42(11):2303-8. [Medline]. Teh J, Stevens K, Williamson L, Leung J, McNally EG. Power Doppler ultrasound of rheumatoid synovitis: quantification of therapeutic response. Br J Radiol. 2003 Dec. 76(912):875-9. [Medline]. Strunk J, Heinemann E, Neeck G, Schmidt KL, Lange U. A new approach to studying angiogenesis in rheumatoid arthritis by means of power Doppler ultrasonography and measurement of serum vascular endothelial growth factor. Rheumatology (Oxford). 2004 Dec. 43(12):1480-3. [Medline]. Salaffi F, Carotti M, Manganelli P, Filippucci E, Giuseppetti GM, Grassi W. Contrast-enhanced power Doppler sonography of knee synovitis in rheumatoid arthritis: assessment of therapeutic response. Clin Rheumatol. 2004 Aug. 23(4):285-90. [Medline]. Fukae J, Kon Y, Henmi M, et al. Change of synovial vascularity in a single finger joint assessed by power doppler sonography correlated with radiographic change in rheumatoid arthritis: comparative study of a novel quantitative score with a semiquantitative score. Arthritis Care Res (Hoboken). 2010 May. 62(5):657-63. [Medline]. Fiocco U, Ferro F, Vezzu M, Cozzi L, Checchetto C, Sfriso P. Rheumatoid and psoriatic knee synovitis: clinical, grey scale, and power Doppler ultrasound assessment of the response to etanercept. Ann Rheum Dis. 2005 Jun. 64(6):899-905. [Medline]. Cheung PP, Dougados M, Gossec L. Reliability of ultrasonography to detect synovitis in rheumatoid arthritis: A systematic literature review of 35 studies (1,415 patients). Arthritis Care and Research. March 2010. 62(3):323-34. Bruno MA, Wakefield RJ. Chapter 5: Ultrasound of Rheumatoid Arthritis. Bruno MA, Mosher TJ, Gold GE. Arthritis in Color: Advanced Imaging of Arthritis. Philadelphia: Saunders-Elsevier; 2009. 96-122.